Re: First impressions after a long break. You certainly can - 400Cr (Oolite 1.84). That Pulse laser - it's useless. Strip it out, now, and spend the 400 credits on cargo. Better to say 'Strip it out as soon as you reach Zaonce, and buy injectors!' as cargo can get lost/damaged along the way. Cody wrote: Better to say 'Strip it out as soon as you reach Zaonce, and buy injectors!' as cargo can get lost/damaged along the way. If that works … injectors are 600Cr. Can a player make enough money on that first run, with just 100Cr to spend on cargo? Sell the missiles at Lave, perhaps - but the suggested starter-parcel would cover the extra. If I was tinkering with a virgin Jameson - titter ye not - I'd start with 500Cr and no laser. Cody wrote: If I was tinkering with a virgin Jameson - titter ye not - I'd start with 500Cr and no laser. Same here (and I'd maybe ditch all but one missile, as well): more cash = more, and better, cargo in the hold = more profit! As a core start, I think I'd leave the missiles as is - a monkey is a nice round number! I didn't include the latest fixes, since I just want to get a feel of it. I think it could work, especially because there is a choice to be made. Disembodied wrote: Forget the economics of interplanetary trade, forget supply-and-demand: the in-game economy has only one purpose: to allow the player to earn money, to keep their ship flying and to afford more and better stuff. With this logic I don't see any problem with the current system. Ditching the current economic model for a contract only system seems quite limiting to me. I mean I have no problem with making the contract system more robust and while making milk run trading less profitable, but doing away with independent trading altogether seems like it would force the player into a very specific role. I think it would also force the player to run from battle every time since you wouldn't even be able to pick up a few extra tons of cargo to replace what gets destroyed in battle. I do feel that many of these recommendations would be very sensible to integrate into New Cargoes. spara wrote: The way I found the game was through Debian's repository. I did not read anything when I started playing, I just started the game. Me too, I had to use google too learn how to dock, never played Elite. I think a tutorial start option is a needed and creating an OXP to test it is a great idea. I think it could even be pretty basic and integrate some current OXPs like Instrument Landing System and Combat Simulator. Selecting a tutorial start could simply take one to a GUI were the player could select different options like docking or combat. Britnoth wrote: Equally moving towards the 3rd would make the game much more bland to me, without the history of the original game to build upon. I have always felt that this bland base is better for using mods to create a completely unique game that is best suited to the players style. There are mods that make combat easier and mods that make combat more difficult. There are mods that support a variety of different careers, gambling, mining, smuggling, salvage, and bounty hunting are some options. Really? I have started with injector and scoops, jumped to Zaonce with an empty hold then attacked a poor cobra mk I and found my pulse laser to be very useful. I really feel the biggest problem with early combat is with the size of pirate groups. 1 on 1 combat with a pulse laser is very doable IMHO. I've even done this without injectors but its hard to pick up all the loot they drop sometimes. Maybe I didn't make as many credits as I would have if I had sold the laser but I think its more fun my way. Back then there was no tutorial in-game. But now there is . What I'm driving at here is something to get the player to somewhat survivable direction when starting the actual game. Redspear wrote: I rather like the generic commodity list as it remains relevant across systems with very different inhabitants and (presumably) cultures. That's what I don't like about it: it assumes that "Food" is the same wherever you go. Kæstur hákarl might command high prices in Reykjavik, for example, but not so much in Tel Aviv (or indeed anywhere outside of Iceland, but you get the point! ). Does it assume such a thing? Are we then assuming that the price offered is not influenced by the quality of and the demand for the item that was purchased? That specific variable isn't in the game but then neither does the variable of food types. Rather, I am free to imagine such variance might exist within the random pricing element that is present within the game. Not wishing to argue for it's own sake here (believe it or not ) but I think such random variances can be imagined to cover all kinds of stuff - once said 'stuff' all gets pinned down then we lose something in my opinion. For example: If I buy food for 2 credits then can I expect it to be the good stuff? Maybe I buy it for 6 credits and the next station only offers me 2 for it, maybe it's not the quality, they just don't eat it here. If I bought from multiple sources then perhaps they are only offering me the average price. spara wrote: What I'm driving at here is something to get the player to somewhat survivable direction when starting the actual game. Looks great. I think getting this info at the start would be very helpful for someone who's never played Elite or any of its derivatives. And here we go, if someone wants to test how the more "guided" start would feel. If you take the initial parcel, you have 48 hours to deliver it and you get 15 credits for your troubles. Stormrider wrote: Ditching the current economic model for a contract only system seems quite limiting to me. I mean I have no problem with making the contract system more robust and while making milk run trading less profitable, but doing away with independent trading altogether seems like it would force the player into a very specific role. 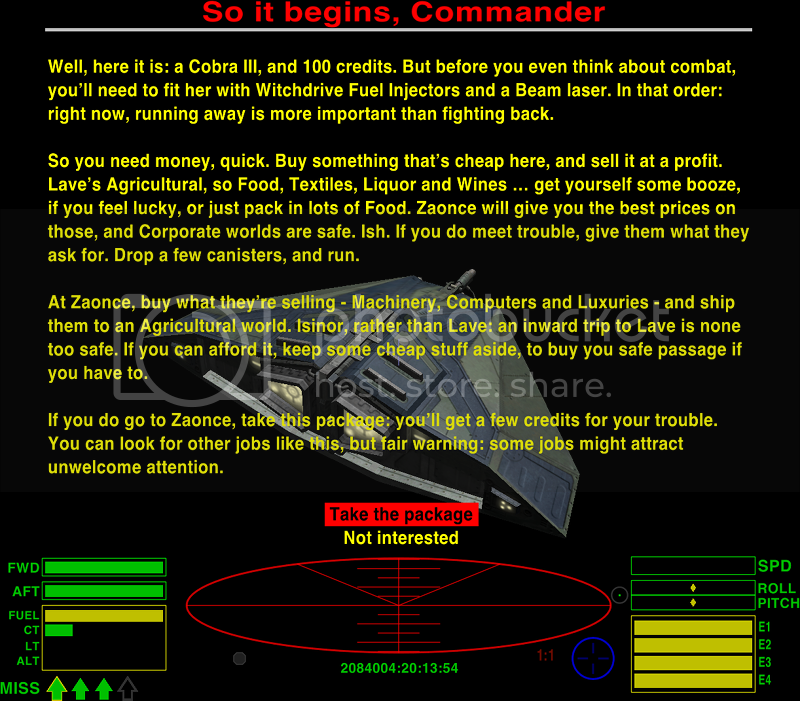 The player would still be an independent trader: you're just selling a service, rather than commodities. The real reasons for ditching the current economic model are 1) it's broken, and 2) it's not fixable. Basically, it's a miracle of programming for a 32K game, but that's as far as it goes: with all the ship and equipment prices based around it, and around the assumption that you're in a Cobra III, "fixing" it would involve rebuilding from scratch. Stormrider wrote: I think it would also force the player to run from battle every time since you wouldn't even be able to pick up a few extra tons of cargo to replace what gets destroyed in battle. A good point. Partial deliveries would still earn partial reward, though - but this could be bolstered by making cargo destruction less likely. Redspear wrote: Not wishing to argue for it's own sake here (believe it or not ) but I think such random variances can be imagined to cover all kinds of stuff - once said 'stuff' all gets pinned down then we lose something in my opinion. Anyway, I'd agree about price range for the most part and your 'do away with it all' suggestion does avoid the problem of needing potentially tables and tables of goods rather than just the one we have at present. What trading perhaps should have that delivery contracts don't is much less predictable rewards. The profit margin at present is rather predictable; it probably needed to be in elite but that is perhaps not the case with oolite. Does somewhere beset by occasional civil war offer higher prices for firearms ocassionally? Does a tedious planet offer more for narcotics and luxuries? Potentially interesting but also more complicated. Computers and furs are the big sellers at present from any industrial or agricultural (respectively) that sells them. What if for each industrial the big profit was to be had from a random industrial product, e.g. computers are cheap at industrial A but expensive at industrial B, whilst machinery is cheap at industrial B but expensive at industrial A. So the biggest profit items will at least vary between systems. Even with a simple set of items like the above, imagine if each planet offered a particularly cheap price for only one of the above (e.g. an industrial selling machinery cheaply) and was only willing to pay significantly above the odds for one other (e.g. the same industrial offering a high price for furs). I've got a good price on the machinery here but will it be what they really need at the agricultural I'm headed to? If not I'll still make a profit but if it's the one they really want then I'll score big! Trading would still be safe and simple but much less predictable and with greater variety - you might actually need to read the price list besides checking out the precious metals and gem-stones! Can't seem to get that to work, spara - am I missing something?